Man the Big East (excluding Nova) is an awful post-season league. As a conference, we have underwhelmed each year in the post-season, and are off to a pretty crappy start this year. Butler, Providence, and Georgetown all lose 1st round NIT matchups. And St. John’s is getting worked by ASU in the play-in game. Update for Day 3 of the NIT. Not a new bracket as there is only one game to update. 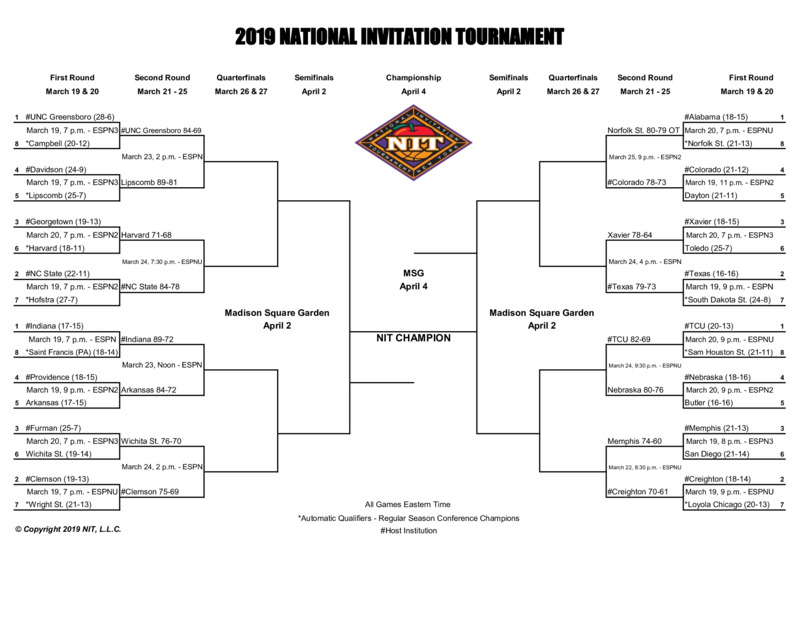 Update for the weekend NIT Games and a new bracket. Sweet 16 won't be set until tonight after the winner of the Colorado/Norfolk St. game. Agree completely. They were 8-11 & 1-6 in the American at one point but won 9 out of their last 11 conference games & are 21-14 overall heading into their game with IU. That's called good coaching and having player development in place. Granted, Wichita did have 5 games against 2 horrible teams(Tulane & East Carolina) during their run but still. The Sweet 16 for NIT is set. You mean the Elite 8. Too much jumping back and forth between tournaments and not enough sleep. znelson15, bumba, ButlerNut and 4 others like this.